Imtiaz Ali's next 'Jab Harry Met Sejal' stars Shah Rukh Khan and Anushka Sharma. New Delhi: The title for Imtiaz Ali's much-awaited movie has finally been revealed - it's called Jab Harry Met Sejal. The only thing is, this movie name hasn't quite created the ripples that Mr Ali would undoubtedly have hoped for. In fact, if the response on Twitter is anything to go by, many are disappointed with the unoriginal title which is clearly an amalgamation of Mr Ali's own 2007 hit film Jab We Met and the 1989 Hollywood blockbuster When Harry Met Sally. Bollywood desperately needs a creative film title writer. 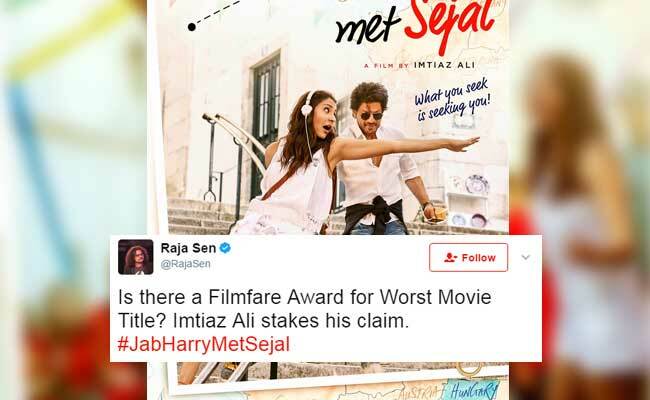 Jab Harry Met Sejal - So much build up only for this rip-off of a title?! The posters of #JabHarryMetSejal are very refreshing and unique. Just the title is a bit underwhelming. #JabHarryMetSejal is finally the title of SRK - Anushka's next movie with Imtiaz Ali. Hope the movie is better than the title. What do you think of the name? Let us know using the comments section below.